This month I’m writing about some very unique looking planes that are extremely functional. 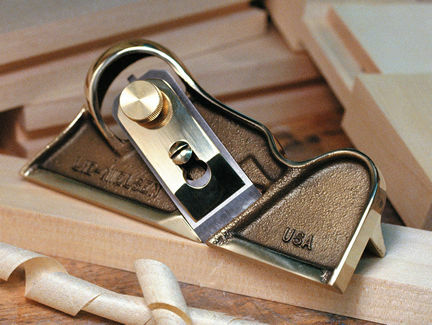 These are the #95 Bronze Edge Planes. Lie-Nielsen makes these in both right and left hand versions, so you get optimum results no matter the grain direction of your work piece. The #95 has a sole and fence that are precision lapped so they are 90 degrees to one another. The iron is 1/8” thick to prevent chattering and is bedded at 12 degrees. The iron is A2 and comes with a 25 degree bevel straight across and is skewed 17 degrees in the plane body. Since the iron’s bevel is ground straight across, like most bench and block planes, you can sharpen it using any side clamping or top clamping honing guide with good results. I treat the iron just like the majority of my other plane irons and hone a 5 degree micro bevel, raising the iron to 30 degrees. On the first honing, it only takes a couple of strokes on the 1000 grit stone to raise a burr on the back of the iron. Subsequent honing may require additional strokes on the stone to generate the burr. Raising a burr will always be the indicator that you’ve completed the work with this stone. Another couple of strokes, at the same angle, on the 8000 grit stone and the bevel side is complete. Now it’s just a matter of providing the same level of attention to the backside of the iron. As you may recall, I use David Charlesworth’s method to handle the back of the iron. Place a thin ruler on the 8000 grit stone, just far enough from the far edge that the iron’s cutting edge hangs slightly over the edge, while the non-cutting end rides on the ruler. Pull the iron’s cutting edge onto the stone, then push back off to the starting position. Repeat this a few times until the burr on the back of the iron is gone. You should see a very thin polished area, on the back of the iron, at the very cutting edge. That should get you a shaving sharp edge on your iron. With that said, be sure you handle the iron carefully. It only takes a moment of inattention to need a trip to the safety kit, or even a stitch or two. Don’t ask me how I know. Place the iron back into position on the plane, and slip the cap over the iron. Lightly tension the cap, then while holding your thumb on the cap, move the lever under the iron to advance or retract it. Like with most planes, you sight along the sole and look for the thin black line that shows when the iron is above the sole. If the line only shows on one side, move the blade until it is consistent across the full width. I usually retract the iron to the point where I just lose sight of the black line, and then I tension the cap. This gets me very close on cutting depth and angle, and I take the plane to a test piece of wood to finalize the setting. If the resulting test is not exactly 90 degrees, you can adjust the iron to get it perfect. Moving the iron so there is more opening near the fence will lower the angle, while additional opening near the edge will increase the angle. Notice the small lever behind the non-cutting end of the iron. If I want to use the #95 to make the edge of a board square to the face, I start by first flattening a reference face. Once complete, I make a mark so I know my reference face, as I always want the fence on my #95 to be up against that side. This will provide my best results, and is why Lie-Nielsen makes both right and left hand versions of the #95. If you always put the fence against your reference side, you’ve got a 50/50 chance that the grain will be your friend. With both versions of the #95, it’s just a matter of choosing the plane that takes advantage of the grain on any given board. While the primary use is for squaring the edges of stock, you can easily add wooden shoes to the fence, to establish for instance, a specific angled bevel that might be outside the range of adjustment of the iron alone. These planes can also function to widen dados and adjust the depth on rabbets. If the bronze is leaving a mark on light colored wood, you can add a thin strip of wood or tape to the sole/fence to prevent contact, or polish the same contact areas on the plane. Now go make some shavings! Let me know if you have any questions or suggestions for future articles. Click to take a closer look at the Lie-Nielsen left hand and right hand edge planes. 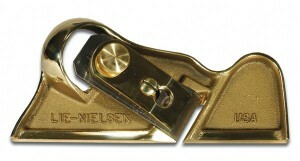 Click to see Highland Woodworking’s entire selection of Lie-Nielsen hand tools. Lee Laird has enjoyed woodworking for over 20 years. He is retired from the U.S.P.S. and works for Lie-Nielsen Toolworks as a show staff member, demonstrating tools and training customers. You can email him at lee@lie-nielsen.com. wow – very cool planes! i’m glad that they’re really functional. otherwise, they sure make a beautiful paperweight!